Grapeseed oil is produced from the seeds of grapes as a byproduct of the winemaking process. It is prized for its neutral flavor -- it works well for dressings and even stir-fries -- and its numerous health benefits. Full of antioxidants, grapeseed oil can be purchased at health food and specialty grocery stores, as well as some upscale supermarkets. Despite the many health benefits of grapeseed oil, it is still an oil and should be consumed sparingly in your daily diet. ChooseMyPlate.gov recommends no more than 5 to 6 teaspoons of oil per day for women, and a maximum of 6 to 7 teaspoons of oil per day for men. This recommendation pertains to all fats, including butter, olive oil and fats from food, such as nuts and oily fish, including salmon and trout. Furthermore, the American Heart Association recommends that you get no more than 25 percent to 35 percent of your total calories per day from fat. This means a maximum of 500 to 700 calories per day from fat. Grapeseed extract contains proanthocyanidin, which can help lower your overall blood cholesterol levels. Proanthocyanidin is a natural antioxidant that, according to a study published in the "Journal of Medicine" in 2000, lowers total overall cholesterol levels, as well as the amount of low-density lipoprotein, or LDL, in your system. Levels of LDL, also known as "bad" cholesterol, in people were found at lower oxidization levels after they had consumed grapeseed extract. But further research is needed, including studies with larger pools and for a longer period of time, before there is conclusive evidence regarding the benefits of grapeseed oil for high cholesterol levels. Animal and human studies conducted between 1950 and 2010 on the cardiovascular benefits of grapeseed oil were reviewed in a 2011 article in the "Journal of the American Dietetic Association." Researchers concluded that grapeseed oil conclusively helped lower overall blood pressure levels and decrease overall heart rate. 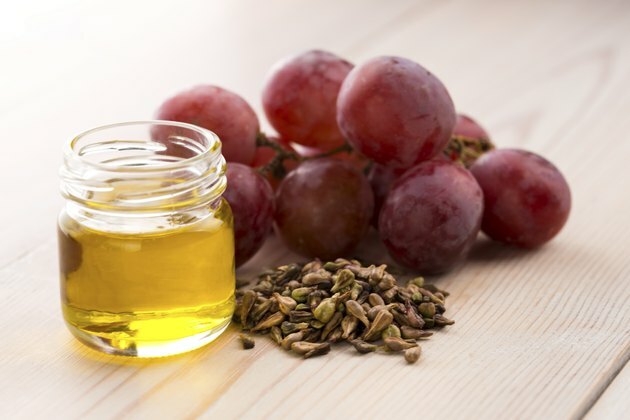 While the scientists found that the studies done thus far on grapeseed oil were very promising in terms of improving cardiovascular health, they concluded that further research, particularly long-term studies, would be beneficial. Grapeseed extract may help fight certain types of cancer cells, reducing their ability to reproduce and grow. A 2006 article in "Clinical Cancer Research" found that grapeseed extract delayed and held back the development of colorectal cancer cells in mice. There was no evident toxicity involved from taking grapeseed extracts. But the ability of grapeseed extract to prevent cancer development was applicable only to colorectal cancer cells, and further human and group studies are needed. Which Is Better for High Cholesterol: Fish Oil or Flaxseed Oil?